very popular with our customers, because this one does not smell so ugly! 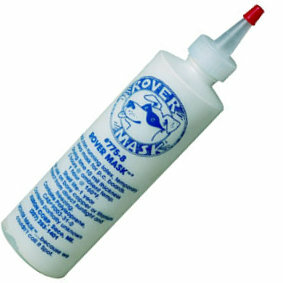 Rover Mask 775 is a premium quality, latex, temporary solder resist suitable for both manual and automatic dispensing. A 10 mil coating of the non-running, thrixotropic (18,000-22,000 C.P.S.) jell dries in 3 hours at room temperature or 1 hour at 160 F. (71 C.). Once cured, Rover Mask™ 775 will not lift or separate during soldering. It is exceptionally cohesive, generally peeling off in one piece, thereby simplifying removal. Once cured, bio-degradable, non-toxic Rover Mask™ 775 can be disposed of with other common, solid wastes. 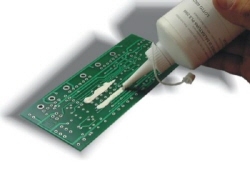 It has a shelf life of one year and is suitable for use as a conformal coating.